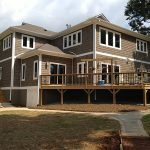 Our general contractors are your best choice when you want to feel confident that the details of your home renovation project are correct in Huntersville. Did you know that hiring a general contractor could be the best decision you make for your upcoming home remodeling and renovations? Whether you are planning to upgrade one room or your entire home, you shouldn’t have to worry about coordinating multiple contractors to get the job done. That’s where a general contractor can provide a wealth of solutions, so that your project goes off without a hitch. At Chad Goodin Signature Homes, we have been serving as general contractors for homeowners for more than 30 years, and we are happy to assist you with home remodeling and renovations of any size in Huntersville, North Carolina. One of the most important things general contractors do is coordinate all the moving parts of a construction project. If you have a plumber and a tile layer coming to work on the bathroom, a general contractor from our team will make sure that the plumber gets to complete his work, so that the tile layer can then successfully complete their job. If you want to replace the flooring in your living area, we’ll make sure that the drywall person is scheduled after the flooring installation is complete, so that you get the best results from both projects. Our general contractors are also your best choice when you want to feel confident that the details of your home renovation project are correct. At Chad Goodin Signature Homes, we make sure to work with you from design to project completion, so that we can be clear about your needs and expectations throughout. This allows us to provide superior service and give you confidence that you have the right home builder for the job. Call us today to learn more about our services! t Chad Goodin Signature Homes, our general contractors proudly serve Huntersville, Mooresville, Cornelius, Davidson and the surrounding Lake Norman area of North Carolina.